While it may not be the best way to create a web page, many people only use Microsoft Word as their primary web authoring software. If you only have access to Microsoft Word as your web authoring software, you should make sure you add alt text to the images in your Word documents. Adding alt text to the images will ensure that these images can be properly described to screen reader users when they access the web pages created with Microsoft Word on a web browser. 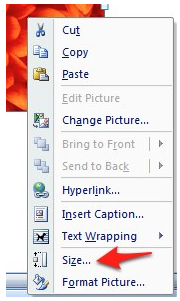 Add the image to your document by choosing Insert, Picture and locating the image on your computer. Right-click on the image in your document and choose Size. Select the Alt Text tab and enter your alt text in the text area. Choose Close to close the Size window. 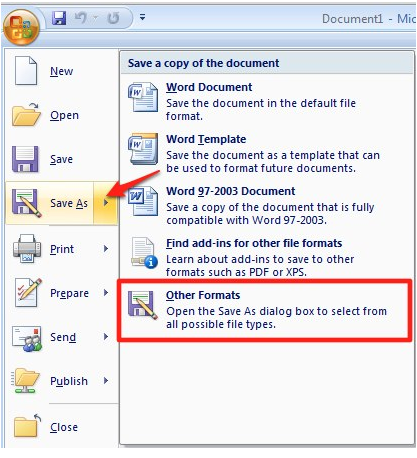 To save your Word document as a web page, select the Office button and choose Save As, Other Formats. In the Save As window, choose Web Page from the Save as type menu and select Save. You can then open the document you just saved in your favorite web browser. 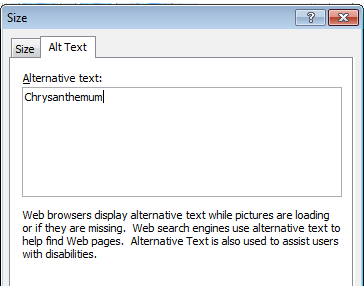 To view the alt text added by Microsoft Word in Internet Explorer 8, choose Page, View Source, then locate the IMG tags in your document. Each IMG tag will correspond to an image on your web page. One important limitation of Microsoft Office 2007 is that it does not make it possible to add null alt text. Null alt text should be used for decorative images such as bullets and dividers. This null alt text makes it possible for screen readers to skip these decorative images.